If you are new here, you can find all of the posts in our Overcoming Eczema, Food Allergies and Night Terrors series hereto get caught up! Bella slept from 9:30-8:00 without a peep! Per doctor’s request, I did not give her Chloral Hydrate but put her back on the Clonodine to help her sleep. The sleep doctor recommended we keep her on the Clonodine for a while. Bella was especially quiet today without her buddy. She has come such a long way. She took her vitals and a scratch test without even blinking. The only thing she is still terrified of is the nasal wash, and I can’t say I blame her. It takes several nurses to hold her down and blast her snot out. She has developed a really bad cold, so I am glad they are doing this. We had a team meeting with 3 doctors today. Starting tomorrow they want to keep her bedtime routine as is (bath, topical steroids and wet wraps on hands and feet, lotion and dry clothes on the rest of the body). The morning routine is now to use protopic and dry wraps on the hands and feet and lotion on the body. Her skin is clear other than some redness on her hands and feet, and we are already using less steroid creams than we did at home! We challenged baked milk today. Baking milk alters the protein so that some milk allergic people can tolerate it. I think she ate four muffins in small doses spread throughout the day. She passed! This means she can eat food with milk in it that has been baked for at least 30 minutes at 350 degrees or higher. Studies show if she eats baked milk daily, she will eventually desensitize to fresh milk. There was another little guy doing the exact same baked milk challenge. He had an anaphylactic reaction after the second serving. The nurse administered an epi pen, gave him a breathing treatment (he has asthma) and benedryl. After a couple hours of observation they sent him home. Somehow I missed the excitement. I think I was in the bathroom. I don’t wish that kind of reaction on anybody but if it’s going to happen, I wish I had seen it. What a good lesson it would have been for me to see that kind of reaction and how it was dealt with! So now that Bella has passed baked milk, they will try giving her something that has been cooked a shorter amount of time, like cheese. If she passes that, they will give her fresh milk. The last time she had cheese her whole body turned bright red, hot and itchy for a day or two. Antihistamines didn’t help. It was awful. I’m trusting they know what to do here if that happens again. Since the almond butter contained traces of peanuts and hazelnuts, the doctors decided we needed to do a puddle test before we do a food challenge with it. A puddle test is a scratch test with the actual food. She passed the puddle test, so we will challenge almond butter next week. We left the hospital around 4:30 and decided since it’s Friday, we wanted to do something fun. The local aquarium gives free admission to Ronald McDonald House guests, so we decided to check it out. We had a blast! They have one of those restaurants where your table is right next to a huge aquarium. We made reservations during a mermaid show. 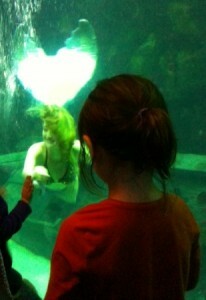 Seeing mermaids was a dream come true for Bella! We have the weekend off from the hospital. I’m looking forward to hooking up with an old friend and her family who live in Denver. Yes! This has been life changing! Thanks for the encouragement Daisy! I am loving reading your posts! How long is this treatment program and is this something that your insurance covers? I am interested in checking in to this for my daughter. Hi Christie, Yes, my insurance said they would cover it after I met my deductible. It’s a 10 day/2 week program. I can’t recommend it enough. We stayed at the Ronald McDonald house for $20/night. That place is amazing! Volunteers fed us dinner every night. The biggest expense was the plane tickets which someone generously gave us. We missed you…. Patrick misses his buddy. 😉 And the dinners were mostly fabulous… Love you all….xo…. In case your daughter hasn’t done the almond test yet, Barney Butter is a brand of almond butter that is peanut-free with no other tree nuts. My peanut-allergic son likes it. I’ve found it at Whole Foods, if there is one nearby, and online. I’ve only recently discovered your blog and am enjoying it. Thank you! We did the almond butter test and passed! Thank you for telling me about Barney Butter. I’ll keep my eyes open for it.